Why Fathers’ Day celebrations mostly quiet still remain a mystery. Even with the knowledge that there are some amazing fathers, stereotypical depictions of them are unloving, strong, masculine, unsympathetic among others. This must be one of the reasons for the low hype of this celebration. To make the #fathersday2017 more prominent for the wonderful fathers this year, The Christian Blog Ghana is introducing the Fathers’ Day Write-Up Promotion. This competition is seeking to celebrate the amazing role played by fathers in Ghana. 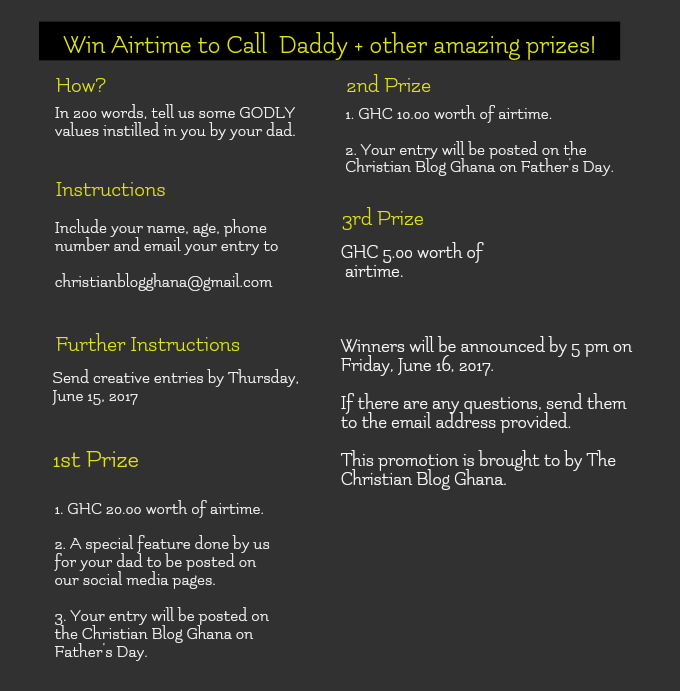 The first prize is GHC 20.00 worth of airtime, a special feature done by us on your dad for our social media pages and your creative piece will be posted on the Christian Blog Ghana. The second prize is GHC 15.00 worth of airtime and your creative piece will be published on the Christian Blog Ghana. The third prize is GHC 5.00 worth of airtime. The deadline for submission of entries is Thursday, June 15, 2017. We look forward to reading some creative pieces on the GODLY impact that our dad’s have instilled in us over the years! Author The Christian Blog GhanaPosted on June 5, 2017 June 5, 2017 Categories The Christian Blog Ghana NewsTags Father's Day Celebration, Fathers' Day, Fathers' Day Competition, The Christian Blog GhanaLeave a comment on Join Us Celebrate Fathers!